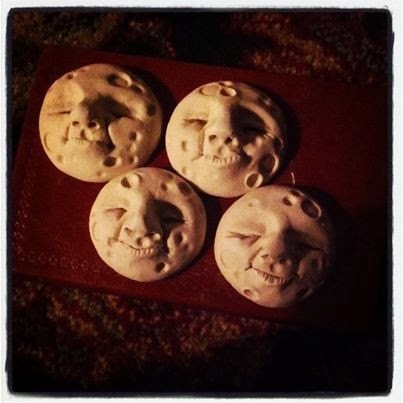 I posted this picture the other night after working on these little faces into the wee hours. I love watching other artists work so it occurred to me this morning that you might like to see one of these moony fellows being sculpted. Typically I do not work this quickly. I'm a bit of a slow poke and enjoy sips of tea and nibbles of cookies as I do my mess making. I am fairly certain I've hit some sort of time warp making this video because it's completed in a 1/3 of the time it usually takes me. Let's blame it on the 3 cups of coffee this morning. So cute! But the video wasn't there(:-( ! Thank you for showing us some of your Pixie Magic!!!!! I enjoyed watching the video.